A series of short posts about specific elements of teaching practice that I think are effective and make life interesting. Some are based on my own lessons and others are borrowed from lessons I’ve observed. It’s a natural, sensible tendency for teachers to want to spread questions around a class, involving as many students as possible, keeping them all interested, listening to each other and thinking about the question in hand. However, recently, I’ve been trying to explore what happens when you focus more intensively on just one student to probe more deeply into a set of ideas. This approach is based on the idea of dialogic teaching that colleagues at KEGS have explored in recent years. Normally, when the class has been set a question to discuss in pairs, I tip-off one pair that I’ll be asking them to share their response with the class. This gives them time to be ready; they’re not surprised to be asked. Then, I bring the class to attention and focus on one student in this pair asking for ever great clarity in their response. Here’s an example from a Year 10 Chemistry lesson. Looking at rates of reaction curves, what do the graphs tell you about the reactions in each case? What were you saying in your pair? The reaction finished at the same point in each one, but they just did it at a different speed. OK, that’s right. Is it the acid or the limestone that determines that reaction is finished? The acid is used up. And how did you control that to make it the same? We measured out the same volume each time. So what feature of the graph tells you that the reactions have finished? They become a straight line because no more gas is being produced. Why is it a curve and not a straight line? It goes up quickly to start with because there is more acid to react with and more reactions take place and then it slows right down….it gets less steep. Good.. and what’s a more sophisticated term for ‘goes up quickly’ ? The gradient is greater? Excellent…So how is the gradient different for the three different experiments at the start? The gradient was the greatest for the small chips. Which does what? Which makes the reaction happen more quickly….at a greater rate. Ok. now try to put that altogether in a full answer all at one go with all the correct terminology saying what happened and why. Ta-dah! The final response was superb, linking these ideas together. This approach clarifies the understanding of that student and makes them string ideas together.. but, because everyone else is listening, they all get to put their thoughts together. I think it works well because it models the thought process of one person.. it’s not a case of pulling together different people’s ideas. There’s an intensity to it; a hot-seat aspect that makes that one student really think hard about terminology, sequence of cause and effect and so on. It makes you, as the teacher, listen to their answers closely and, by not moving on to a new student, you create a dialogue that deepens rather than widens the thinking. That’s often a powerful effect. In some lessons where question spreading is the norm, students often throw in new ideas rather than deepening the idea that’s already in hand. It’s important to finish with a re-constructed answer of the kind you want – a full, extended answer. Students can then write down their versions of the same thing having seen this modelled. 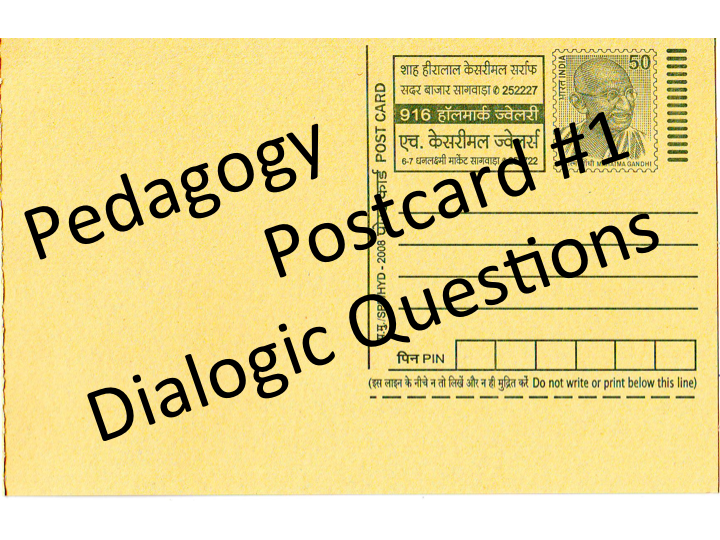 You can’t do this all the time, but every so often, Dialogic Questions are very effective. « New Challenge Ahead. I’m moving on. I was completely taken in by your dialogue example, and since reading Teach Like a Champion (esp. Right is Right) have tried to implement this into my practice. But I do worry that honing in on a single student like this allows others to fall asleep. Following up with a written task is a nice idea to ensure everyone stays switched on though, especially if they’re warned that they’ll be asked to do this. Thanks…Yes,.that’s another good method but the table-tennis is worth a try too. It gets a slightly different response and can be sharper. How do you deal with the student that is really stuck in providing a response during the dialogue? I would attempt to refine the question until they can provide a response, but this can stall the flow of the dialogue and they are often flustered or find it difficult to continue. Really interesting article, thank you. We have been having the same conversation about this in our school, which is a junior school. With the younger children we do find that the extended 1:1 questioning can cause the other children to switch off as they find it hard to listen to such an in depth discussion for a long period. A good way around it for us has been to use this type of questioning more in small group / guided group situations when the rest of the class are working on separate tasks.